THE Bishop of Durham is to retire, it has been announced this morning. The Right Reverend Tom Wright, will step down on August 31. Dr Wright, who will be 62 this autumn, is returning to the academic world, and will take up a new appointment as research professor of New Testament and Early Christianity at the University of St Andrews in Scotland. "This has been the hardest decision of my life," said Dr Wright. "It has been an indescribable privilege to be the Bishop of the ancient diocese of Durham, to work with a superb team of colleagues, to take part in the work of God's kingdom here in the North-East, and to represent the region and its churches in the House of Lords and in General Synod. "I have loved the people, the place, the heritage and the work. 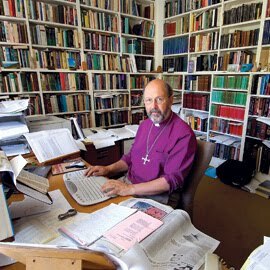 "But my continuing vocation to be a writer, teacher and broadcaster for the benefit (I hope) of the wider world and church, has been increasingly difficult to combine with the complex demands and duties of a diocesan bishop. "I am very sad about this, but the choice has become increasingly clear." Dr Wright, a lifelong Newcastle United fan who was born in Morpeth, Northumberland, has been Bishop of Durham since 2003. BB NOTE: I agree with Grant LeMarquand, who writes at SF, "this is a matter of fulfilling a vocation. Tom believes that he has a few more things to say to the academy and the next generation of theological students and scholarts. He enjoyed being bishop of Durham and is very proud of the diocese and the work the clergy and people do there in one of the poorest parts of the UK, but he will be 62 this year and the big book series (the little books are great too, but the big set ‘Christian Origins and the Question of God’) may still have several volumes still to be born. The next violume is his magnum opus on Paul (actually it will be two volumes) and then at least a volume on the evangelists (as opposed to ‘the historical Jesus’)." There are many ways to confront the crises facing the communion and a major one is raising up the next generation of theological and pastoral leadership. Tom Wright appears to be making the decision to invest in the theological education - a great, great decision for the church. trouble with the CofE is that politics and the govt are involved in choosing bishops.....crazy but true...and some will be saying that since we had a believer like +Tom, we should have an unbeliever to follow....they do not put it like that, they talk of "balance" etc etc but the upshot is the same. The criteria in 1 Tim and Titus 1 are not relevant to some who, for reasons of historical accident, have a say....that is how Rowan got the job....as a socialist, he was the choice of "new Labour" and favoured largely because of his revisionist views on certain issues....which Nazir Ali did not and does not share.....but I know who of the 2 was best equipped to be ABC. And Nazir Ali became a bishop how, Londoner? A smear campaign from "the left"? Irony is not in your make-up, is it, Londoner? Another topic completely, I see that the principle "in the eye of everyone save the believer religious faith is necessarily subjective, being incommunicable by any kind of proof or evidence" is now enshrined in English Law. oh, I love a bit of irony, rabbit....e.g. a church which says it must take a revisionist line because of its context.....but ignores the reality of its irrelevance and terminal decline....in its context. That is ironic. I was trying to think where Tom Wright could do the most harm, in the Church or at a university? How long might it be until the bishops of Fulham, Ebbsfleet and Richborough are forced to retire?